I woke up several times during the night, sweating intensely and feeling the onset of something bad coming on. Fever. Slight one, but still. I had figured that something was wrong already when I went to bed. My nose had clogged up entirely. Not good. 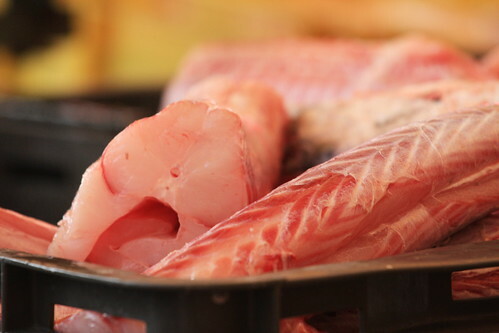 I must have caught something a few days ago as I had felt a slight itch in my throat on the rest day. The two days of battling the rain and wind didn’t help much. 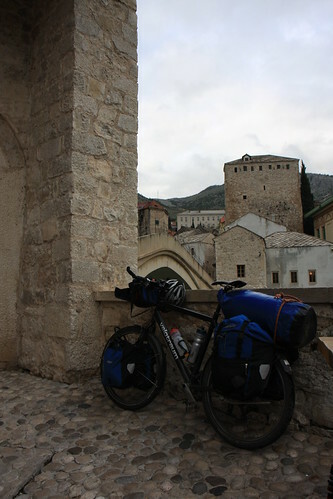 At any rate, on the bike I went and I figured that I could at least make it to the first major town in Montenegro. Wind from the front … what else is new? And up the hill to climb what is known here as the thick mountain. 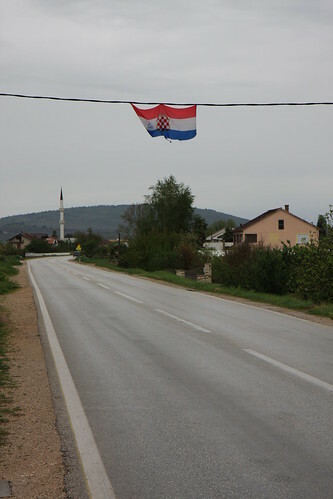 It is also where the Croatian border crossing is located. Not much of an uphill, but I could feel that I wasn’t 100% for sure. Made it up and arrived just after having been passed what seemed like a convoy on a mission consisting of four BMWs of various models hailing from Zurich. When I got to the top, all was well I thought and the treatment at the other border stations must have been an exception. I was wrong. The first guy I looked quizzically and he motioned for me to pass. When I did looking around for someone else, someone in the booth to the right barked at me. Did I mention it rained right there and then? Crewcut guy with nothing to do in his booth tells me to get in line behind the cars in the other lane. He was reading a magazine. The line was no longer under the roof. It was raining, I think I should mention that. I said “Can I stay here and wait?” “No!” Me: “You’re joking, right?” “No!” Me: “You do realize it’s raining right now?” Shrug. Shrug on my side also. Stepped back two meters, plunked my bike right there - not in anyone’s way and looked to see which car was the last one and thought I would wait my turn. Barking behind me. Didn’t want to turn around. Out he came and snapped “Passport!” - I gave it to him and he disappeared for 10 minutes in the booth where the cars were lined up. A bus driver behind me had seen my passport and asked what was wrong and I said that I didn’t have a clue. Turns out it was a bus full of Kosovars and they didn’t get the royal treatment either. 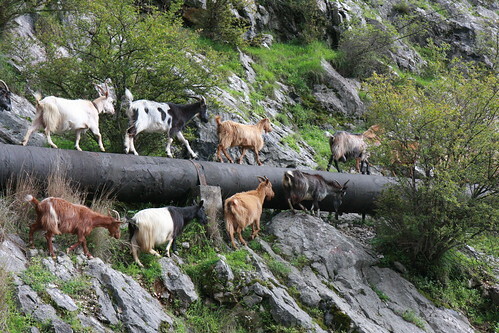 We struck up a conversation, they thought I should go through Kosovo and shouldn’t worry about anything. Nice invitation, I might just go! We passed the time by them asking me about the trip when eventually Mr. Crewcut comes back and presses the passport on my chest. My cheery “Thank you!” didn’t leave much of an impression with him. The Kosovars only raised their eyebrows and shook their heads. They wished me well and off I went. Not sure how much longer they had to be up there. Downhill a truck overtook me and right on his tail one of the BMWs … and this guy was positively insane. 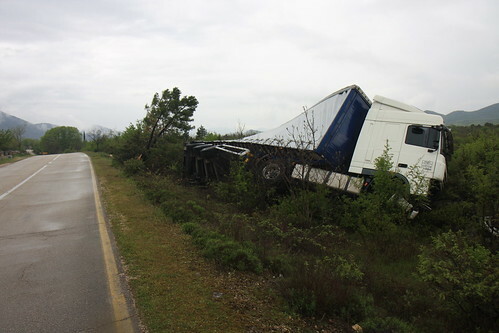 Narrow mountain road, truck doing 60km/h downhill, was doing OK, but it was curvy and the guy tries to overtake. Truck moves to the left, signaling to stay behind. Sharp right hand turn. Oncoming traffic. Truck moves right, BMW just barely makes it behind the truck. 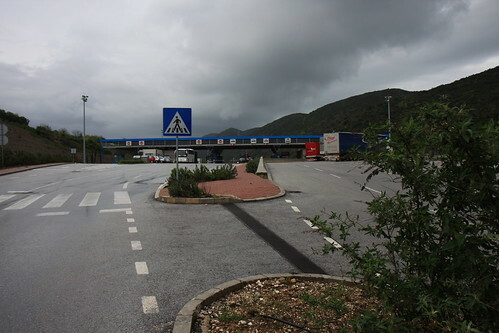 I reach the Montenegro checkpoint a couple of minutes later, see the truck driver still shaking his head and overtake the Beamer at the control post. Family of four in a BMW X5. Couldn’t quite believe it. Montenegrin border guard gives me a cheery hello when he sees me and the bike, asks me where I’m going, figures I have gone nuts when I give him the answer, but sees me off with a smile and an honest-sounding good luck. 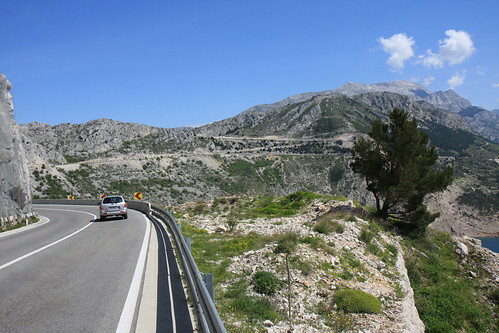 Wow - what a difference to the higher altitude Croatian border guard. I reach the first town and see this “institute” and just when I snapped my picture encounter two Dutch guys who happen to heal some ailment in the “institute”. We chat it up for a bit, they warn me from all the traffic. Buckle down I thought, but turns out it is like BiH sort of. Much more relaxed. Much more space - for the most part. There is the occasional idiot of course. Headed into Herceg Novi, updated the website and now the sun is coming out a bit more. Visited the center, which is quite nice and relaxed there for a bit and eventually move on. I figured that I would either go to Kotor or find something on the inbetween. The scenery that I encountered was breathtaking. The fjord is downright gorgeous, steep cliffs seeming to fall from the skies straight into the water. Some towns and a decent road clinging to the edge of the water. Nice towns, not fully renovated - but enchanting. More smiles on the faces of people, big hellos. I decided to go all the way around the fjord instead of taking the ferry and thus the shortcut to Kotor. It was so worth it. 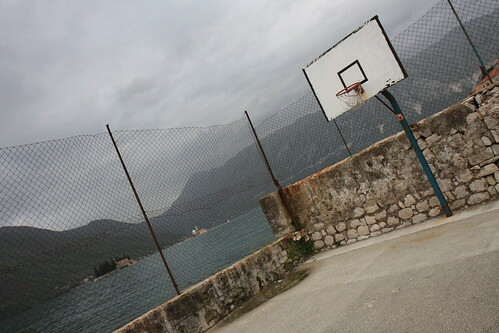 And I also came across what must be one of the best basketball court locations in the world. My system was alright, I took it slow and the scenery was so worth it. At a town about 8km before Kotor I got something to drink and when I asked about a place to stay one guy struts off with me to his friend Dusan. Speaks excellent German, his mother was German, his father Hungarian. Just came out of surgery the day before. Wanted to go home and not stay in the hospital. 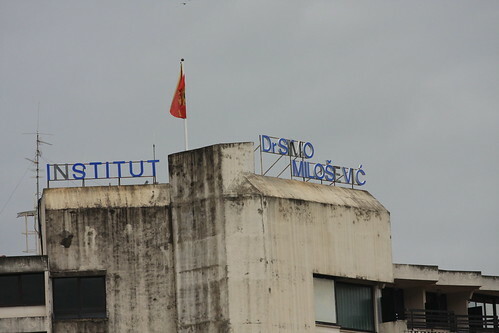 Turns out that Montenegrin hospitals have sort of closing hours … along the lines of “You can get sick from 6 am to 7 pm on weekdays, all other times, there are not meds in the hospitals and any medicine you need you must buy at the pharmacy.” So, he went home and said that he was glad to have done so. I wasn’t sure about whether to stay or not. Headed into town and looked around - all accommodation was booked out or not available for a night or not for a biker. There was one place … But I decided to head back the 8km I had come from and we chatted the evening away for a bit longer talking about the EU (Dusan doesn’t like it), his daughter (8 years, with excellent German), life in Montenegro (getting better) and the building boom that is setting in here right now (look around ye will see). Still not feeling all that great … will to see what the situation is tomorrow and decide whether to stay and wait another day to move on. Promise to be shorter from now on. Rambling on too long. And as almost always, there are more pictures on the flickr page. This is what I was going to write: See yesterday’s entry. Then the day changed in more ways than one. Wind and rain - not quite as bad when I woke up and so I set out with a determined look on my face thinking that this will be doable. Left Neum in good spirits and then the pummeling that I got yesterday started all over again. For the first km things were alright - crossed into Croatia again and something clearly hit the fan. And I mean big time. Wind coming from all front angles, rain beating down hard. Crossed the border, the power of the small man in that a border guard waved me over beaten as I must have looked and just before I pulled out teh passport as he had told me to do waved me over to his colleagues. Not a good start into the day peoplewise. The rest is quickly told. More of the same. I became stoic and just took the beating as it happened. When it got too much I took cover and then started anew. Eventually I passed Dubrovnik without seeing much of it. Didn’t feel like stopping and so wanted to move on to Cavtat. Passed the now closed and bombed out hotel where I stayed as an 8-year old kiddo and just before pulling up the hill to get to Cavtat I met Marko. Another Marko. It had stopped raining now - I was happier again. He asked what I was doing in this weather on a bike. Where I had biked from. Turns out he used to work in Germany and now is back in Croatia. Worked in Heidenheim and told me all about it. Then he invited me for tea into his place which was a few km further on. Figured what the hey and went along. Great family, three kids - one daugher speaks good German from watching cartoons on German channels that I had never heard of. Sunshine by now. Then Marko said, we will find a place for you. We went all over, turned up empty. Fully booked, not wanting someone for one night or completely out of price range. Mostly a good combination of 2 and 3. Marko was distraught … said that the whole area had become insane and that all you can afford these days was a birdcage. Went back and had wonderful homemade salami and meats, pickled peppers and other good stuff. More phone calls and more running around … still nothing. I opted to bike a few more and am happily writing this in a dry tent in a not-yet-dry meadow a few klicks behind Cilipi. 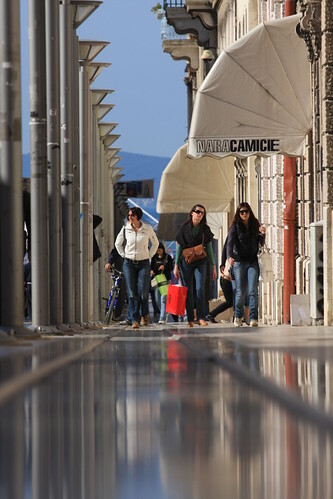 This means that the idea of visiting Dubrovnik had to be discarded. Pictures on the web abound though. Marko made all the difference in the world. Thanks a million. It’s people like him that make the trip what it is. What a long day … it was a good start I thought until I realized that the grumbling in the distance was not from any trucks but that there was a thunderstorm rolling in. Just managed to break the tent down and head out before things came down. On the road for about 15 minutes, the road became moist and while the t-storm was only behind me at one point, it all of a sudden seemed all around me. I was heading into some dramatic scenery. The mountains were becoming higher, the grades steeper. The added effect of the weather played a part as well for sure. Soon enough I was in the middle of hard rain, having to make a considerable detour because of some road closure. 25km worth of a detour. What was supposed to be a 12km ride ended up being a bit longer with a lot more ridges to climb over. I stopped a couple of times to find some cover. The second time was close to someone’s house. The guy wouldn’t even say hello, just ignored me. Can’t say that I was particularly unfriendly or anything … even my attempt at getting some water from him failed. He clearly understood me, but just turned around. A bit frustrating. 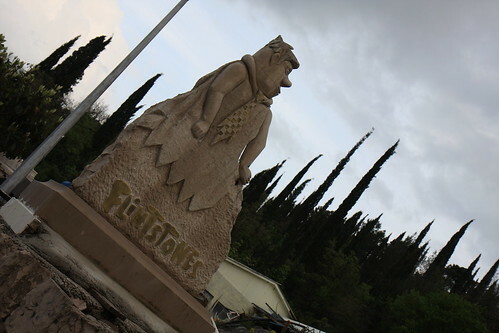 Once the rain tapered off a bit I went on to Netkovic, the border town on the Croatian side. Road conditions were … not so good. The road was not designed to handle heavy traffic and certainly not the amount it had to handle. Starting out fine, the uphill was partially devoid of any solid surface only to become worse before it joined the main road again. 1. Talk to the person next to you or on the phone. 2. Pull out of your lane to overtake the already speeding car in front of you. Without checking at all whether there is anyone coming at you. 3. Keep doing what you were doing, smoke, talk, speak on the phone, grab a magazine, etc. 4a. If you’re seeing a car, hit the accelarator harder and pray that you will make it. 4b. If you see a biker, don’t do anything, trust he will realize that in case of a crash, he will loose and don’t mind him. 5. If someone lets you know that you’re off your rocker, yell at him, threaten him with the family. 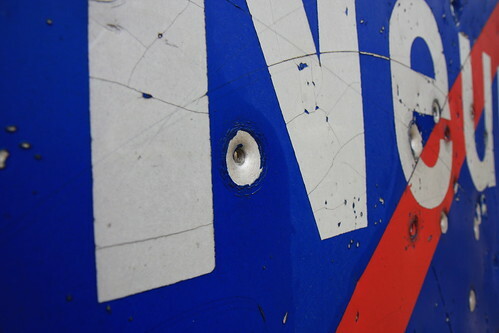 Truck drivers are an entirely different matter - keep on doing 1-3 and don’t worry about 4-5. You are invincible. Or maybe not. Passing the unremarkable border with now lower windows, having to duck to see the chest of a big border guard, the driving on the other side eased right away. More distance, less speed and more regard for human beings in general seemed to be the order of the road. And just to prove the point, those cars and trucks passing more closely mostly had Croatian license plates (the underlying assumption is of course that a Croatian license plate represents a Croatian driver as well, a contestable assumption for sure and I’m also aware of the ethnic issues prevailing in this part of the world, see this picture for example). I tried putting the distance to Mostar behind me. On the way I had seen a number of shelled houses as well as pockmarked hosues. Definitely a former war area. 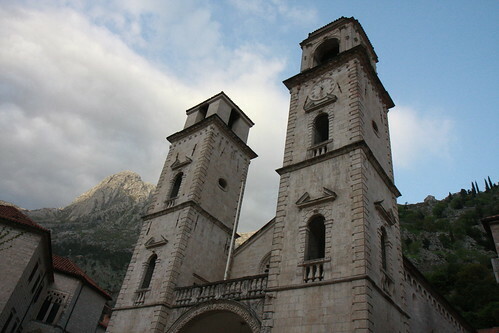 And if anything, Mostar goes to show this. Bombed out houses line the streets. The center is rebuilt, but very close to the tourist places, things aren’t so pretty. It will take time - the bridge that everyone gawks at was a quick project, though by no means the only way to cross the river. Found a place after all couchsurfing options failed. The owner is a former soldier and has issues walking because he was shot in the leg by a sniper. He also has strong sentiments about politics … interesting to say the least. I will stay for one day of rest and then move on to Dubrovnik. Waking up to a crowd of cleaning ladies who were busy smoking, answering cell phones and drinking coffee (loudly) is why I’m not a fan of hostels any longer. Or maybe it was just this hostel. Left the place and checked out Split. After a slight detour I arrived in this ancient city with the Palace of Diocletian as the centerpiece. It has flair I must say and provided for nice strolls in the alleys and alongside the massive stone walls. Once I saw the Nike Kids store though I felt I needed to leave. Corporate what - Croatia I guess - had taken over. For some reason I was reluctant to get on the road and the start was a slow one. Dodging heavy city traffic I tried to make some progress towards calmer roads - had lunch in Baska Voda, dangling my feet in the clear turquoise water. Back on the bike was a bit of a struggle again, the area undulating and sometimes hilly without any flat stretches to speak of. Guess just one of these days. Maybe I need another rest day … guess what? Rest will come after tomorrow. Moved on to Makarska and found out that the website is back up and running again. A big thank you to Simon for setting things straight again. Couldn’t have done it without him. There will be the odds and ends most likely, but it’s looking pretty again. My apologies to everyone for the downtime. I tried to do some more mileage towards the end of the day and ended up feasting on a concoction of pasta, green pesto, fried slices of zucchini and carrots. It was great … for me at least. Topped things off with a honey laced yoghurt. The silver moon is shining through the branches of the olive tree that I am sitting under … couldn’t wish for anything else. ed on bulk cranberries, dried banana chips and pistacchios. Life was good. 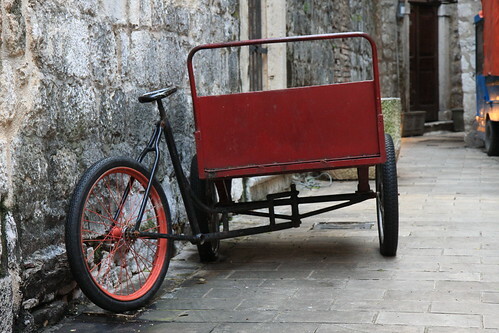 Sooner than I thought I arrived in Trogir after receving an amazed but inspiring look from an old man who just raised his arms and smiled at me, a small picturesque little town surrounded by water and walls. 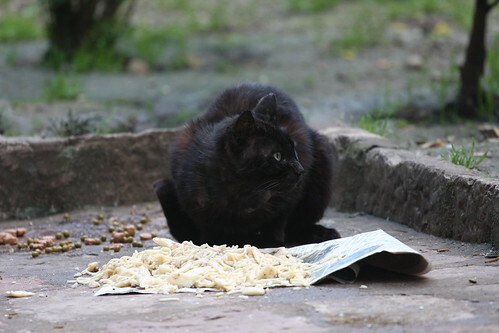 Finally got a hold of an internet connection and found out that none of the couchsurfing people in Split could host me. Too bad. Cycled on, trying to find a good spot or campsite, but soon enought I was in urban territoriy. Not a good place to camp out. Two choices - go past Split and find a place. Not a real option since it was getting dark. Took option two - whipped out the Lonely Planet and found a nice hotel. Am still not sure I’m German … couldn’t find anything to complain about. Have been ranting for too long.